I always love finding recipes that are healthy and delicious. Pinterest has proven to be a great resource for me lately as they’re so easy to find and I love that you can see what the final outcome looks like (I don’t know about you, but I need to see a pic of the dish before I want to make it). Anyways, here’s a recipe that is super simple, healthy and delicious! Marinate the chicken breast(s) in something relatively light and not overpowering (I used Ken’s Light Italian Dressing). Make or buy bruschetta (to make mine, I used medium tomatoes, red onions, basil, garlic, salt and pepper, drizzled with olive oil). Grill or bake the chicken until fully cooked. 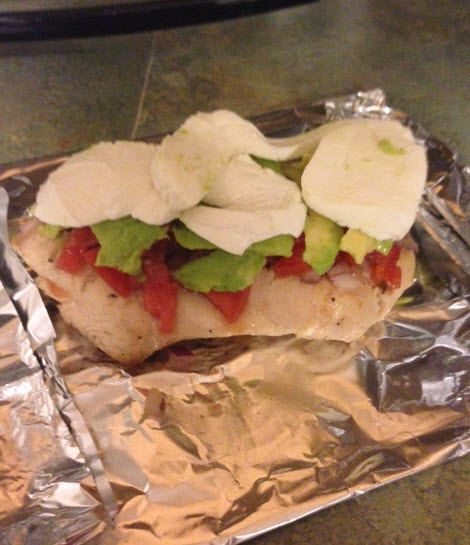 Once it’s cooked, place a spoonful or two of the bruschetta on the chicken breast then top with the avocado slices and mozzerella. Let it cook for an additional 5 minutes (or until the mozzarella) is melted and beginning to bubble. 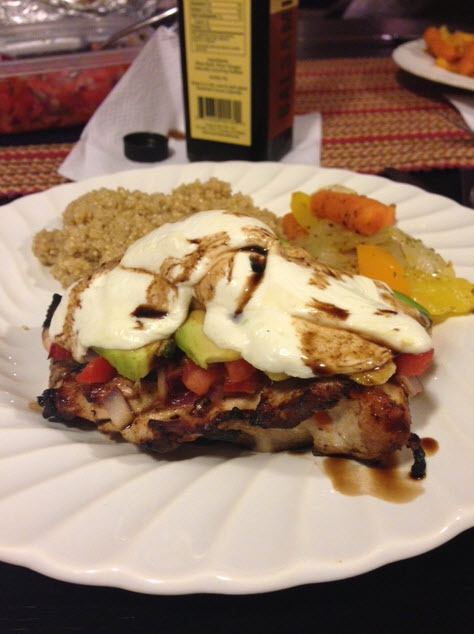 Place on a plate and drizzle balsamic vinegar on top for additional taste. I served it with garlic quiona and grilled veggies. Now it’s time to eat…enjoy! Monday's almost over. (THANK GOD) but I know we're all still upset that another weekend has since bit the dust and we're left with a full week ahead of us with work to get done, diets to adhere to, gym sessions to muddle through and errands to check off the list. But all I have to say is… thank you Lord I am not this girl. And you should all feel thankful too. This video came out Friday (and completely made my day) and it's internet ratings have still yet to come crashing down. This poor poor girl is currently the laughing stock of America's pop culture. And that, that's a place I would nottttt want to visit. p.s. when you're twerking by yourself, with candles on….and video taping it– you really can't complain when something like this happens. Just gotta think, "I deserved that." My older sister, Courtney, is having a baby girl!!! It’s the first grandchild on either side of the family so you can only guess everyone’s excitement. I am lucky enough to say that I will be the Godmother of this little bundle of cuteness and I cannot wait another second to meet her. 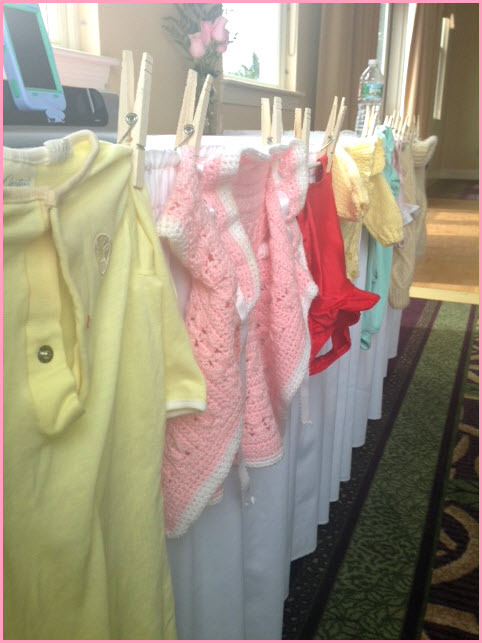 Last Sunday, my mom and I threw her a baby shower and I thought I’d share some pics and how-to’s. 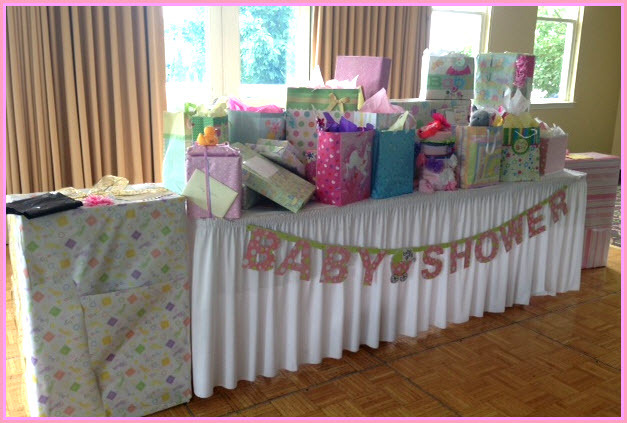 I wanted it to be a beautiful baby shower– one that was classy, cute and chic all at the same time. Since we know it’s a girl, I obviously wanted to have lots of pinks and make it super girly. However, I didn’t want it to be so over-the-top that it was ‘too much.’ So I settled on a ‘Vintage/Rustic’ theme. Color theme was pale pinks and creams with pops of dark, richer pinks. I wanted it to feel like an elevated country theme (without the ‘twang), so I went with distressed woods, mason jars, homemade drink stirrers, cardboard straws, and “vintage” baby clothes strung throughout the room. Below are some pics from the party! My mom saved some of her favorite outfits from when each of us were babies, so we took those and strung them across the present table to add a personal touch. In order to spruce up the bar, I got wooden skewers for grilling and wrapped pink washi tape around it to make little pink flags for guests to add to their drinks! We placed this sweet sign on top of the bar — best part is that it acted as a great decoration as well as a nice gift for my sister to take home for the nursery. As for the tables, I bought $1 mini-sized easles and painted them with chalkboard paint in order to write out what ‘activities’ we had going on during the shower. 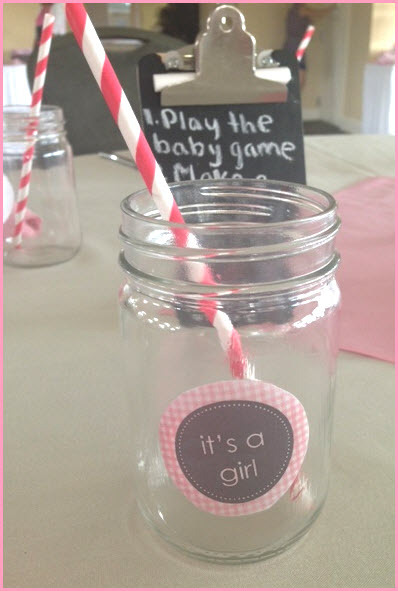 I purchased plain mason jars and printed out some adorable ‘it’s a girl’ cut-outs and used modge podge to adhere them to the glasses. 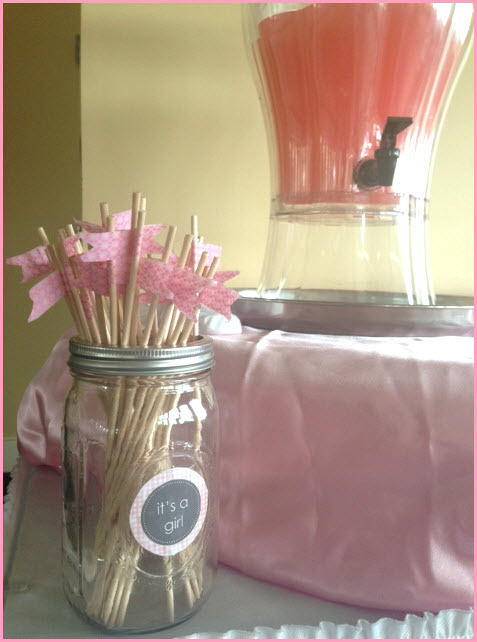 I loved this because it had multiple purposes– decor, water glasses, and our guests party favor. 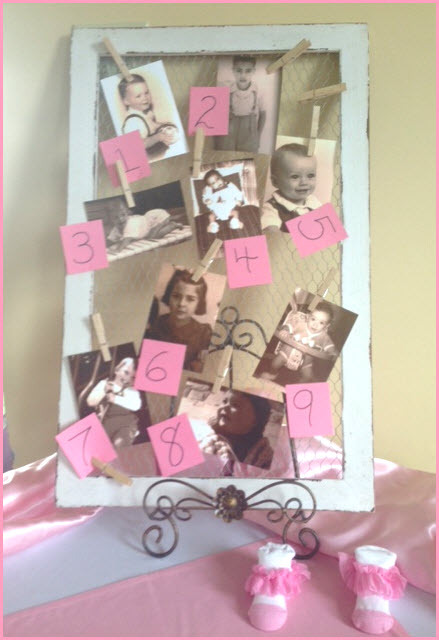 For the one of the ‘activities,’ I printed out baby images of each of the immediate family members. Guests then had to fill out a sheet guessing who was who. I made them all sepia tone to give it the rustic look (plus, it made it harder to guess who was who). At the end of the party, we revealed who won from each table and the winner got to take home the centerpiece (an oversized vintage milk jar with two pink roses inside). 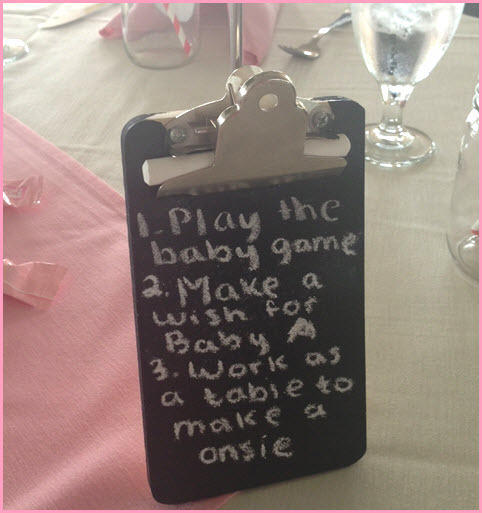 We also had plain white onesies on each table and asked guests to decorate it as a table–they came out adorable and my sister is planning to put them in the baby’s baby book. 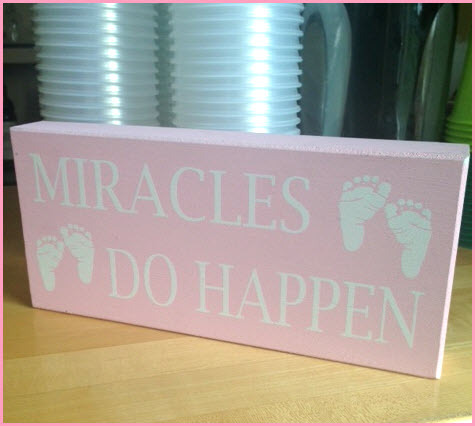 Lastly, we had pink cardstock cut up and placed on the table when guests first walked in and asked that they make a wish for the baby. These will get given to her when she’s older and should be very special. 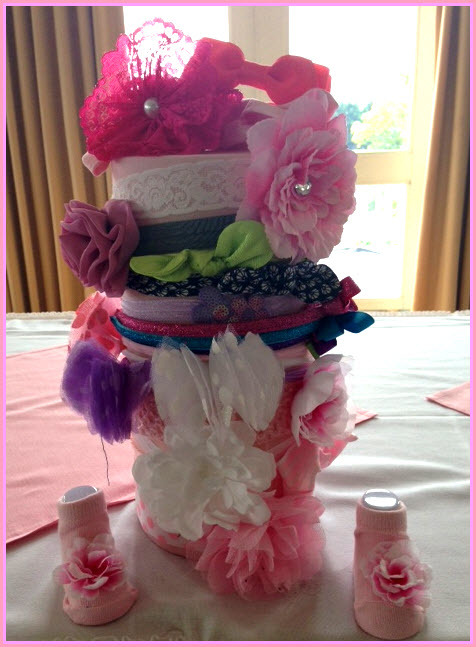 Last but not least (this was my favorite), when guests were responding, I requested them to bring a cute headband so that I could stack them all together and showcase during the party. I took a large candle and wrapped it in pink tights so that the wax wouldn’t come off onto the bows. I loved the way it looked and the bows people brought were just darling! Less than a month until our little princess is born and I am so excited to meet her!